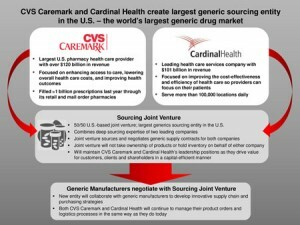 CVS Caremark, Cardinal enter 10-year joint venture. Carbon copy of Walgreens, AmerisourceBergen deal. Express Scripts is next. 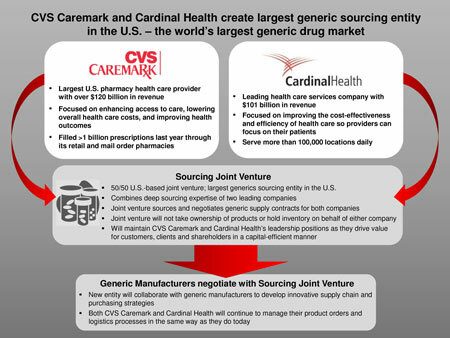 In a direct and quick response to the Walgreens – AmerisourceBergen – Alliance Boots deal, announced last April, CVS Caremark and Cardinal Health announced a 10-year joint venture for the purpose of bulk purchasing generic prescription drugs (see related CNBC news article). CVS continues to vertically and horizontally integrate through acquisition (Coram Infusion Services) and vendor partnering (Cardinal) to strengthen its competitive position against Express Scripts and Optum. Unless ESI and Optum take a similar approach, they will be at a distinct competitive disadvantage, particularly, in the generic drug market. CVS Caremark and Walgreens both offer retail drugstore outlets and they both drive margins from revenue sources, which Express Scripts and Optum don’t have. Only CVS Caremark combines retail muscle with PBM muscle. PBMs, or Pharmacy Benefit Managers, provide outsourced prescription drug fulfillment and management to employers nationwide. What these two deals ultimately mean is consolidated pricing power in the generic drug market (related post); this in turn will lead to higher prices for generic drugs, whether they are purchased by employers or consumers.